Spend a Day Fishing in the Calm Waters of the Biggest Lake in Costa Rica. 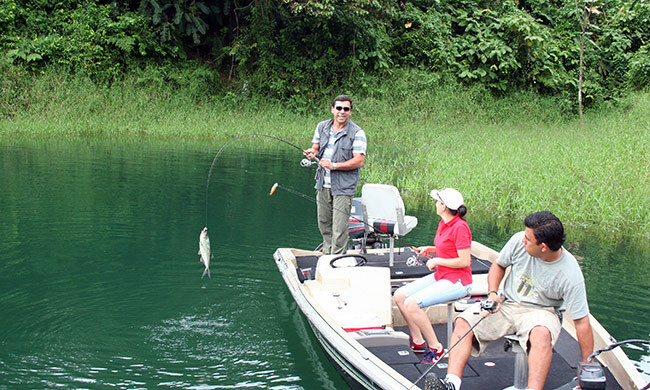 Enjoy a day of spectacular freshwater sportfishing on Costa Rica’s largest lake, Lake Arenal. Your professional bilingual fishing guide will take you out on a custom 20-foot bass boat complete with Yamaha 4 Stroke motor, trolling motor, and all bait and tackle (spinning rods, bait casters, and fly rods). Fishing here will be targeting tilapia, mojarra, the hard fighting machaca, and the delicious rainbow bass. Price noted is for full-day tour. Half-day tours cost $348. Half days include snacks and drinks (coffee, water, soda, beer) and full days include snacks, drinks, and lunch. Pick up is at 5:30 AM and return is 10:30 AM for half days, 2:00 PM for full days. Maximum two people per boat; transportation included for 1-4 people. Learn more about Sportfishing in Costa Rica in our guide!